On Monday 8 February, the Dutch minister of foreign affairs Mr Bert Koenders will respond to questions from the public on social media forum Reddit. 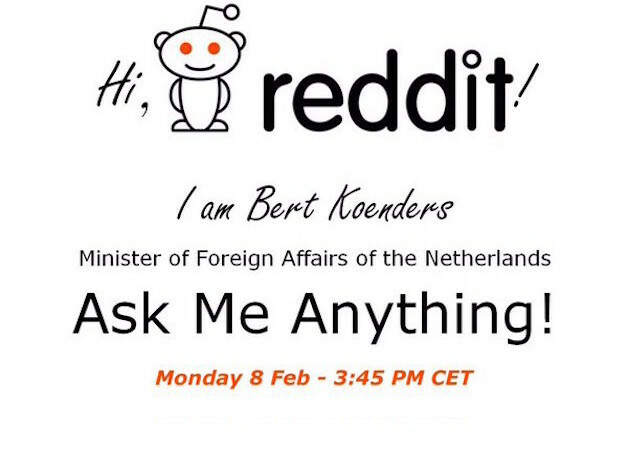 It will be the first time a Dutch minister answers questions through Reddit’s ‘Ask Me Anything’ (AMA) format. Various international politicians and entrepreneurs such as Barack Obama and Bill Gates have preceeded Mr Koenders by hosting an AMA of their own. Minister Koenders will open the AMA thread on Monday morning, 08:30 CET and will sit down to answer questions for half an hour in the afternoon, starting at 15:45 CET. The AMA can be followed by everybody – even without a Reddit account – at this Reddit IAmA page. To ask the minister a question you need to register for a Reddit account. The Dutch Foreign Minister wants to improve transparency of EU decision-making, for example though the use of digital technology.